Specs Include: Solid tonewoods with high gloss nitrocellulose finish, including Indian rosewood back and sides, Sitka spruce top with Aging toner and 5/16” forward-shifted non-scalloped Sitka spruce braces; satin finished one-piece mahogany High Performance neck with Modified Low Oval profile and ebony fingerboard with 1-3/4” width at the bone nut, 2-1/8” at the 12th fret; ebony bridge with 2-5/32” string spacing at the compensated bone saddle; Standard Style 28 back strip, mother-of-pearl dot fret position markers, black and white multi-ply purfling and sound hole rosette, and newly revised Standard Style 28 specs including Antique White binding, Aging top toner, Grover open-back tuners with “clover” buttons, faux tortoise shell pickguard. Arguably the single-most imitated guitar in history, the D-28 is the Dreadnought size instrument made in Martin’s Style 28, and the centerpiece in their Standard Series of professional level acoustic guitars, now newly revised. 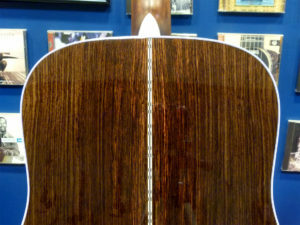 Although it received a leaner neck profile in 1990 and a change in the rosewood species used for its back and sides in 1970, the overall design has remained much the same since the 1940s – until now. 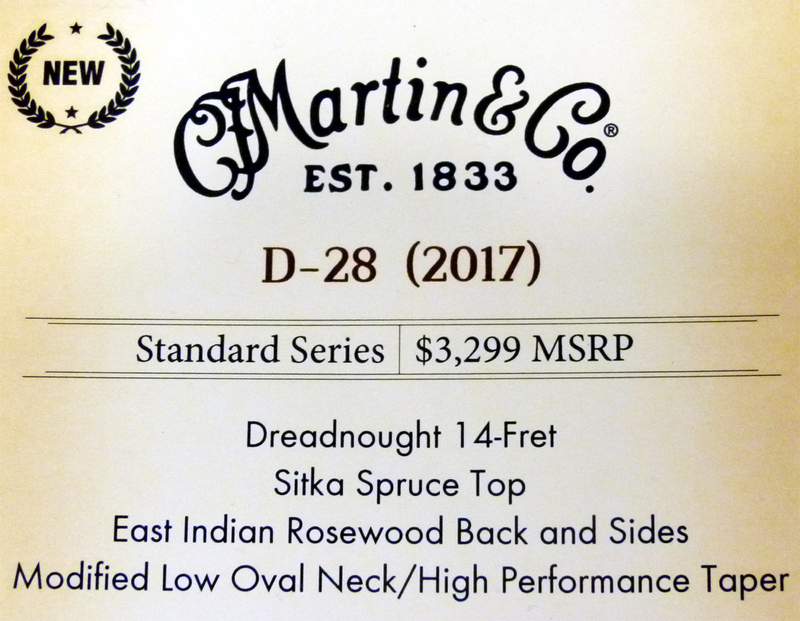 In July 2017, Martin released the new D-28 with, ironically enough, cosmetic styling meant to resemble a much older version of the same model. At the same time, it has been updated to the modern High Performance neck that’s been appearing on most new Martin models these days. But it is the altered soundboard bracing on the D-28 (2017) that makes it a significantly new and different Martin dreadnought. It marks a true demarcation from the Standard D-28 made during the previous 70 years. And that change is apparent the moment the strings are engaged and the soundboard comes to life. It has a dense, robust voice when singing at full strum, yet it opens up beautifully under a lighter hand, with a round throb to thicker strings, but a slender reflective ring to the trebles. The bottom bass E string sounds with firmness and an undertone that adds mass to the A and D string, each having a plump richness to their fundamental notes when struck with a medium attack, but a solid and weighty piano-like report when hammered on with a flat pick. And when an arpeggio or strummed chord is left to sustain, it is the mid-range hum that remains hovering in the room the longest. There is a kind of dryness to the top voice, when the bass and low-mids are flicked with a pick, but a massive thump to their undertone during percussive palm-muting, or what I call “Neil Young whomps.” And there is considerable immediacy to the voice. Even the airy, translucent undertone below the trebles stays right with the fundamental notes, rather than wandering with the kind of flutters heard from a guitar built with scalloped braces. And yet it has noticeably more depth and resonance than typical for a guitar with non-scalloped braces. But then, these particular non-scalloped braces have been forward-shifted, and that makes all the difference. It gives it a vintage-like tone in some respects, and yet it is has its own voice overall that is truly distinctive in its details. One of those details is just how raw and boisterous it gets during a serious attack, particularly in the mid-range, which sets it apart from other Martin dreadnoughts and other Martins in general. It is an invigorated version of the classic D-28. When a player wants to dig in and drive the top, it can get quite throaty and even growly. And yet, light fingerpicking sounds buoyant and cheerfully expressive. On the whole, the D-28 (2017) is one particularly versatile Martin, with a new kind of dreadnought voice, even if it is made to look more like a vintage D-28 than its predecessor. For years, people have wondered if and when the rosewood D-28 would get a makeover similar to the successful renovation of the mahogany D-18. And it has come at last. But instead of going with the cosmetic appearance of a pre-war D-28, Martin wanted Standard Style 28 to retain its large domino dot fret markers made with argent white mother-of-pearl, and the art deco black and white ply bindings that finally replaced the nineteenth-century herringbone trim in 1946. They have treated the top with Martin’s Aging toner, which makes the spruce and purfling look older, yet not as old as their Vintage toner or their Antique toner. And along side it is the new Antique White binding that likewise gives an aged look, but not as old as the grained faux ivory binding seen on other Martins. Additional changes include open-gear tuners, which can hardly be called vintage these days, since they are becoming the norm again in the acoustic guitar industry. 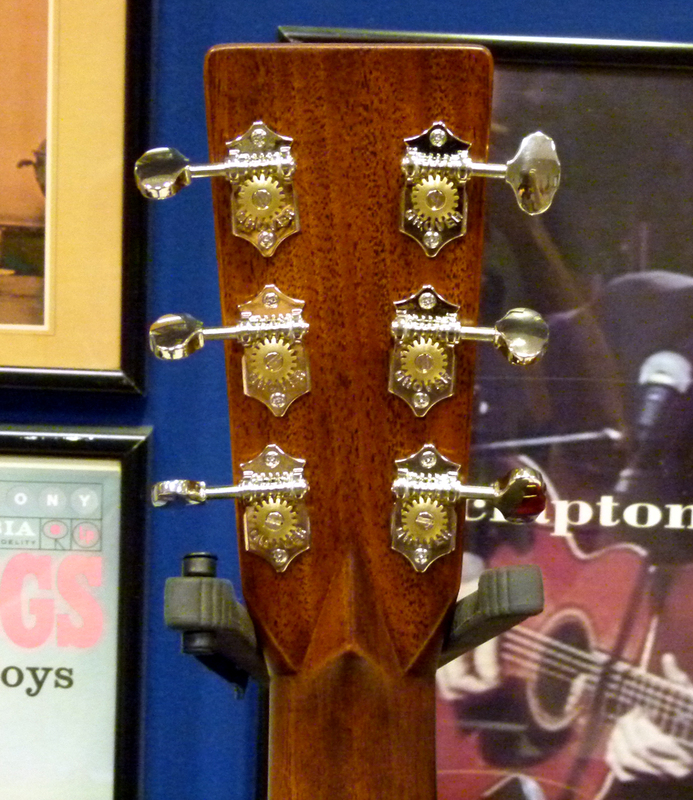 While closed tuners provide self-lubrication, theoretically forever, they are noticeably heavier than open back tuners. And the ones Martin is using these days are particularly light in weight. Frankly, I cannot remember the last time I had to oil a tuning machine. But one thing that definitely makes this guitar look like a vintage D-28 circa 1950 is the beveled pickguard, made from some of the best looking faux tortoise shell I have seen on a Martin in ages. I can’t say if this material is somehow different than what has been showing up on other Martins in recent times, but I think the guard on the particular prototype I played at the Martin factory looks terrific, and quite similar to pickguards on Martins from the Second World War era. While the appearance of the High Performance neck on the D-28 was inevitable, it was a long time coming. 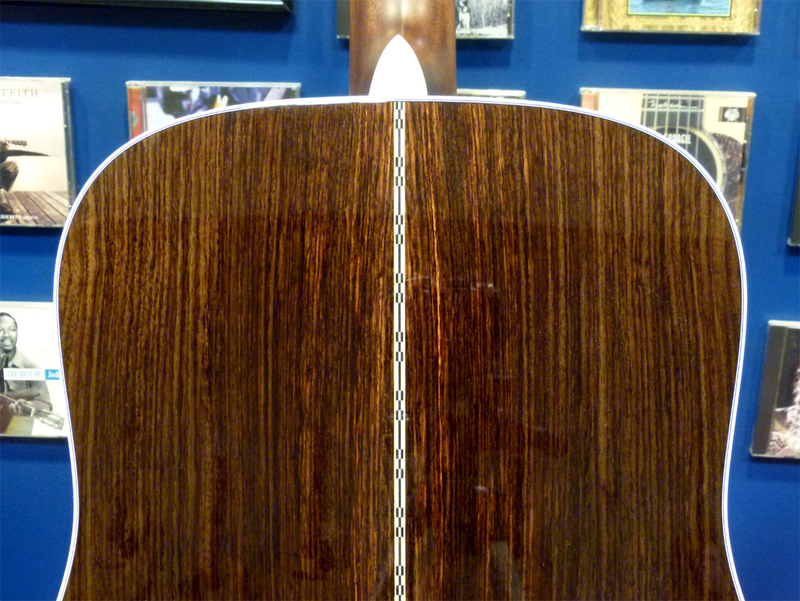 Most of the Standard Series Martins already have this neck. On the D-28, the modern Modified Low Oval Profile replaces the Low Profile shape that Martin introduced in 1985 to appeal to people who grew up playing electric guitars. While still quite shallow compared to vintage necks, the MLO shape is curved to cup the palm of the hand compared to the Low Profile, which flattens it out. The slender 1-11/16th width-at-nut added to dreadnought necks in 1939 was originally meant for a much thicker barrel. Many people felt the Low Profile dreadnought neck was too cramped out near the nut, where open chords require the hand and wrist to make the most awkward angles. So, the High Performance taper starts at 1-3/4” while retaining the 2-1/8″ width at the 12th fret, up where barre chords and lead guitar licks rule. The new string spacing of 2-5/32” is a trifling 1/32” greater than that used with the 1-11/16″ neck, and basically a concession to those who want wider spacing for fingerpicking. It is all part of Martin’s attempt to have a standardized neck that will appeal to the most people while offering the greatest versatility. For all its vintage D-28 looks and new neck, the real difference in the D-28 (2017) from the one made a year ago, is heard in the tone. In direct comparison with a 2016 D-28, the new 2017 model has a more full-bodied sound. Making up the voice of the previous design is primarily an array of six fundamental notes with honed definition, backed by a relatively shallow reflective undertone of dark rosewood warmth. But now, the Standard D-28 voice has gained added resonance and greater spatial depth. The new D-28 (2017) has notes that stand out from one another when played softly or picked slowly, with a more open, expansive, and resonant cellar behind them. But if the strings are energized with faster strumming or picking patterns, then that expanded sonic space quickly fills up with a thicker mid-range presence. The various elements of the voice conjoin, like interlacing fingers from two hands knitting together into a unified clasp, with the fundamental notes standing up like the peaked knuckles, atop that substantial undertone. And this is all due to moving the top’s main X brace to what is called the “forward-shifted” position. The shape and size of the X brace and surrounding tone bars are unchanged. They remain 5/16” non-scalloped braces. The term “forward-shifted” refers to the fact that the original 14-fret steel string Martins from the 1930s had the center of the X brace crossing about one inch from the edge of the sound hole. But what actually matters is how far away that point is from the maple bridge plate, where the metal guitar strings anchor and transfer their kinetic energy to the spruce soundboard, and how that affects the stiffness or flexibility in the area around the bridge plate. Martin changed the position of the X brace in 1939, to what is now known as the “rear-shifted” position, which was about 1-7/8″ from the sound hole, and actually a little closer to the bridge plate than the standard bracing used today, which is about 1-1/2″ from the sound hole. It is believed this was to counter the extra stress brought to bear by heavier strings. It was later discovered that forward-shifted bracing has a notable effect on sound production, including enhanced bass response along with a fuller mid-range undertone. What is most interesting about this change in bracing on the new D-28 (2017) is the fact that the bracing is not scalloped. This is the first cataloged 14-fret Martin dreadnought ever made with non-scalloped forward-shifted bracing. That is because Martin changed the location of the X brace several years before they stopped scalloping braces. “Scalloped” braces means that extra wood has been carved from the bracing struts, to increase flexible. This made guitars exceptionally responsive to lighter playing, while creating an echoing resonance. Martin ceased this practice by 1946, again citing an increased use of heavier strings, but possibly it was just to cut production costs in the economic climate of post-war austerity. In doing so, they created guitars with stronger, louder fundamental notes backed by less intrusive reflective resonance. Scalloped braces returned to Martin in the 1970s, as lighter strings became popular, and the sound of pre-war Martins gained in nostalgic reputation. 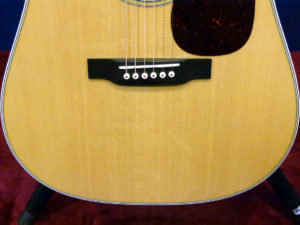 Today, almost all Martins have scalloped bracing, but certain classic models continued to be made with non-scalloped bracing, also known as straight bracing. The tone of the Standard D-28 certainly had its fans, but the sales numbers did not equate to what was meant to be the stalwart ship-of-the-line in the Martin fleet. It simply has not been as popular as the HD-28, with its scalloped braces, and the HD-28V with its forward-shifted scalloped braces. 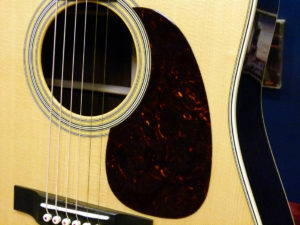 Typical comments from guitarists included the Standard D-28 sounding “flatter” and lacking the resonance of the other D-28 varieties, especially in the bass. I am sure some people inside of Martin wanted to simply combine the HD-28 with the D-28, or even go with the HD-28V while replacing the V neck with the High Performance neck, essentially what they did with the current D-18. But the man whose name graces the headstock was mindful of the D-28’s legacy and the fact that his grandfather’s straight-braced D-28s from the late ‘40s, the 1950s, and 1960s remain highly thought of in the music world. Ultimately they decided to try forward-shifted non-scalloped bracing, and liked what they heard a lot. And a lot of other people will like it too. I am a big fan of the straight-braced Martin sound. And the 2016 D-28 I played at the factory in comparison with the prototype of the D-28 (2017) was a particularly vibrant example. But I still enjoyed the difference that the new D-28 brought to the table. The new D-28 had a rounder bass, and fatter low-mids that set down into voice, adding gravity to the center of the voice. And that helped give the impression of a open cavern below the unwound trebles. It is all about depth. The new D-28 makes the previous D-28 sound like a much shallower voice, which is spread out and linear across the registers, even as it projects clear notes forward into the room. All in all, the old D-28 came off like a pretty tonal vista with an even horizon and not a hill in sight, while the new D-28 had a much more interesting topography. It was deeper, it was more rugged, more massive, and more varied in its dynamics. Although I did not play the new D-28 alongside an HD-28 or HD-28V, I did play several other Martins that day, all of them with scalloped braces. Scalloped forward-shifted bracing often removes the defined edge from the bass notes and low mids, so I cannot hear where one ends and another begins, and it makes the reverberating resonance sound like it’s echoing off walls deep down inside the voice. While the new D-28’s resonance does fatten up the notes from the bass and low-mids, they retain specific identities. And the resonance is not separate from the fundamental. Rather, it is an immediate and direct reflection of the fundamental that creates the sense of depth, so fundamentals from the bass and mids sound like they are rooted down inside the undertone. The tone of the new D-28 has a lot more going on behind the main notes than the older version, and the harder I played it the more that certain something extra rose up to combine with those fundamentals, to create a voice that is certainly fuller and with a bass that is freer. But it was all still very direct, with immediacy and a powerful fundamental personality. 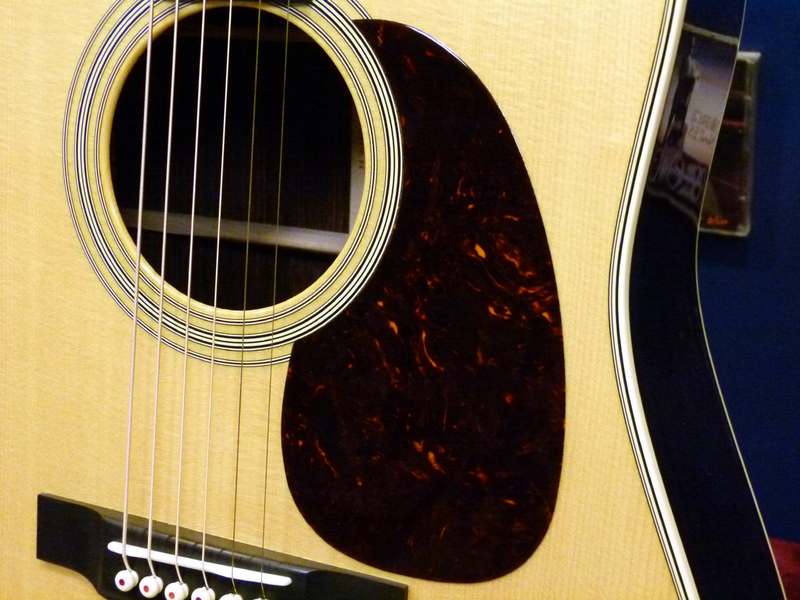 The new D-28 sounded the most like a scalloped-braced Martin during light and spacious fingerstyle playing. The top notes separated nicely, out over a deep dry canyon, but without the noticeable warble of the scalloped-bracing echos. Where it sounded more like the old D-28 than a scalloped braced guitar was during sweeping strums, where the strings joined together, and the voice compresses. Only with the new D-28 came greater resonant depth to that mass of tone and a little less definition to the bottom end notes. In other words, compared to the old D-28, the new D-28 resonates, but it does not reverberate. At least, not in the way a guitar with scalloped bracing does. And that also means the sustained resonance does not waver and wander as much, as chords and harmonics sustain and fade away. With its retro styling and ultra-modern neck, the new 2017 model is a souped up enhancement of the straight-braced D-28, given a more powerful engine, with a roomier interior. And while there is no previous 14-fret dreadnought with the same bracing or quite the same sound, there is something about it that seems like an old guitar. It is apparent when that main voice reaches down into the undertone as the top is attacked, and how relaxed playing reveals a cavernous soundscape beneath top notes that are both dispersed and defined. And it made me wonder if they might have snuck in some new kind of lightly applied torrefaction, which Martin calls their Vintage Tone System. I guess that is unlikely, since they charge a good amount of money for that option. But with full-bodied tone heard from down inside the voice, and in how the top notes fire and die off in relation to the fading of the undertone, I was reminded of Martins made with VTS tops. 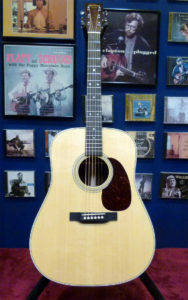 Martin’s first attempt to return to a vintage Martin tone came in 1966, when they introduced the D-35. It was a rosewood dreadnought made with lighter 1/4” straight bracing. The thinner bracing was meant to increase resonance without reverting to scalloped braces, which adds time and cost to the guitarmaking process. But instead of approximating the tone of a pre-war Martin, they invented a completely new voice in the Martin choir, with an increased bass throb to the bottom E string while honing the treble notes into precise points of tonal clarity, which created a different kind of openness around and behind them. The D-35 remains unique, having a sonic pallet that differs from the other dreadnoughts. And now Martin has created yet another new voice. The D-28 (2017,) with its 5/16” non-scalloped braces set in the forward-shifted position, does not sound like any other Martin dreadnought that came before it, even if it shares different kinds of family resemblance with both the HD-28 and the previous version of the Standard D-28. The most significant thing about the new D-28 that has not changed, is the price. If they had not made one design change to the 2017 D-28 from the previous year, it would cost the same as it does today. Martin achieved their goal of instituting the upgrades to the styling and the enhancements to the voice of the Standard D-28 without altering the sticker price. 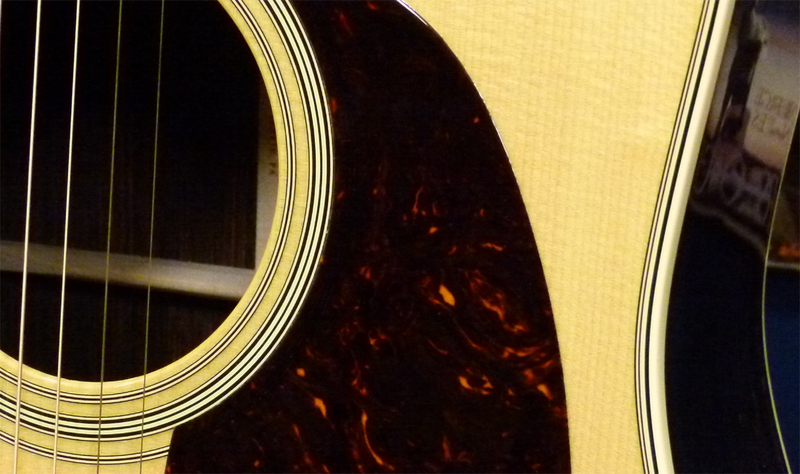 Ask your Martin dealer for their best price.